Byoung Jo Ahn, 26 years old, of Buchoun, Republic of South Korea is making his dream become reality. 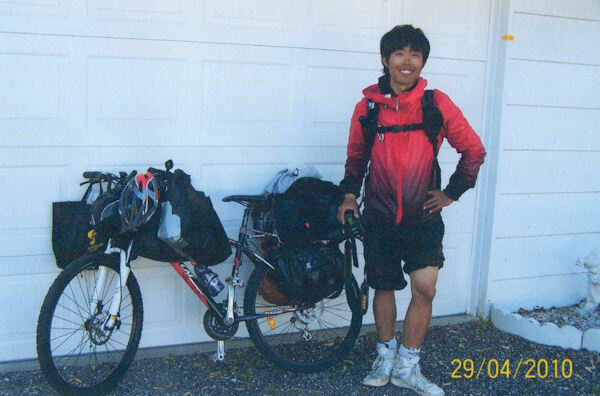 That dream is to ride his bicycle across the United States from New York City to California. He landed in New York and began his journey on March 30th and by April 29th he was in La Harpe. He would like to be in California by June 24th so that he can catch the flight back to South korea. Glen and Marilyn Gleason had a chance to visit with him a little bit on that day. Marilyn said he knew some english but it was difficult at times to communicate with him.